The flag’s images, colors, or patterns should relate to what it symbolizes. (Reference Thematic Elements [The River, Connectivity, Ethnically Diverse Heritage, Innovation. ])the alert Vexillologist should have challenged this design. “Are you aiming to show a connection to Chicago? Does this star (or anything else in the design) clearly symbolize the city’s heritage, or ethnic diversity? Vexillology and Heraldry are cousins in the use of symbolism. Some symbols have clear referents. Due diligence on the part of the designer and the vexillologist should elucidate the symbols chosen. You can’t just say that a symbol such as a star represents X unless it has historically been used in the culture, practice or previous symbolism of the city, region, state or nation who will be displaying it. 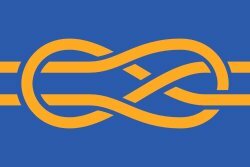 A new symbol may be derived from a geographic feature or landmark of the place it represents if unique and only then it is useful without recourse or reference to previous heraldic or vexillologic constraints.